Last week I stopped by in Kvalitář gallery to see some of the designers & their fresh masterpieces from Mercedes-Benz Prague Fashion Week. Nespresso re-see showroom #MBPFW 2016 was my very first touch with the real fashion world. It was a very first Nespresso “re-see showroom” event, based on the model of biggest world fashion weeks. Delicious coffee, fashion experts & their amazing designs – what a great idea! Visitors of the Kvalitář gallery in Prague, were able to view all the collections presented in recent days at Fashion Week plus a bonus pieces from the new collection by Martina Špetlová. What’s more, not only seen but also touched while talking to their designers. I dint get to the main shows due to the capacity reasons … bla bla I’m just not big enough star & I don’t sleep with anyone important haha – Evidently I desperately need new connections :) It was my very first touch with the real fashion world & fashion event ever. I even froze for a while before entering the room. Just to discover that there is nothing to be afraid of haha. Rooms of gallery were full of masterpieces but this time they did not hanging on the walls but on the hangers. Some of the designers were present & ready to answer any of the questions. A pleasant surprise was that almost all pieces were incredibly wearable! Yep, I remember the hundreds of shows I watched on TV as a child, and 80% of the models have always been totally unwearable extravagant pieces. Results of the designer’s creativity & fantasy explosion, which were not for an everyday life – even for the prom, or any fancy opportunity. Another common link were modern materials such as neoprene in combination with cotton. Neoprene has become incredibly popular material, used by many clothes makers around the world – so-called Scuba Fashion. However it has nothing to do with sport or swimming. Designers combined neoprene with other materials & created elegant jackets, dresses, skirts etc. DEFINITELY one of my favourite materials. Pleasant not only to touch & but wear too. Seems as indestructible material. My absolute favourite was Zuzana’s Kubichkova dress made “with kisses”. Amazing idea using decorative lace as a base material for various garments pieces. 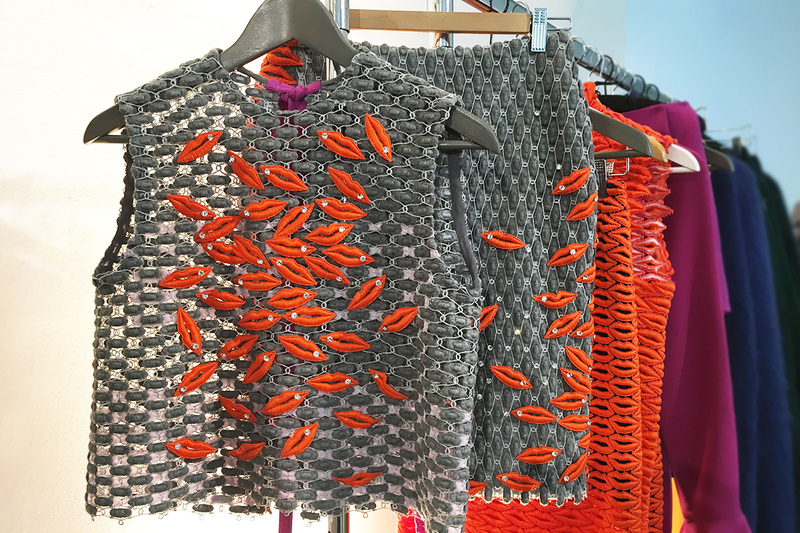 The VAN GRAAF Junior Talent 2016 competition, for clothing designers up to 26 years of age, has a new winner the creative duo of Daniela Peškové & Philip Jakaba. Pešková & Jakab are classmates and students of the Fashion Studio & Footwear Design Prague Academy of Arts. Competition for novice designers was held during the Mercedes-Benz Fashion Week Prague for the third time. VAN GRAAF joined Mercedes-Benz in sponsoring young talents. VAN GRAAF stores in Prague provides individualized service & designers fashion high quality brand as Boss, Marc Cain & Polo Ralph Lauren. A description of the photo (left to right): Lukas Loskot, director MBPFW, Liben Rochová, patron of the competition, Daniela Pešková and Filip Jakab, the successful tenderer Maik Rothhaar, manager of VAN GRAAF store in Czech republic. Source of the professional pictures from #MBPFW – event photograph. Thank you.